An interesting article by Jane Masséglia on museums charging reproduction fees can be found here. Anyone with experience of the process of acquiring photographs from museum files or archives will know how varied, complex and financially horrifying it can be. 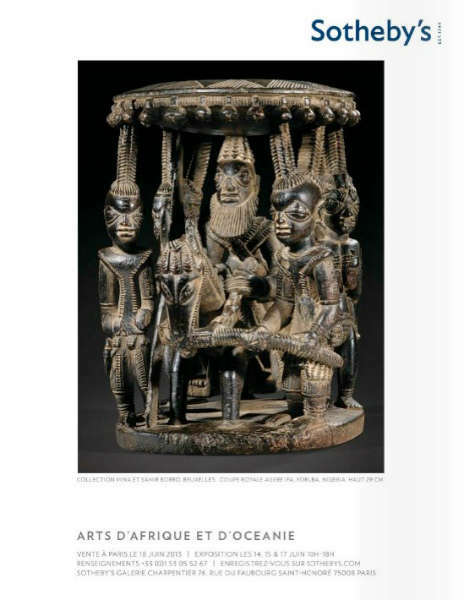 Recently I had the pleasure myself to clear the rights of four old field-photos for an upcoming publication about a private collection of African art. One museum in the UK’s image service demanded £ 75,- for each image and permission to reproduce it. A second museum asked € 100,- for each photo, while communication went painstakingly slow (four weeks and counting). In both cases the field-photos were almost a century old, made by early explorers and ending up in the museum by donation. A small fee of course might not sound unreasonable. Museums need funds, after all. But what if this commercial attitude leads researchers to decide they can’t afford to discuss a particular photo? Then, of course, there is the bigger question of access. Do museums in receipt of public funds have a responsibility to make their holdings available for research? And in recovering the cost of digitising and administering their holdings, should they be allowed to make a profit from charging non-commercial users? Or are they right that if researchers are looking to get ahead by using their holdings, they should, like the keyring-makers and poster-printers, have to pay for them? But even if we accept that argument, the issue remains of how museums could have arrived at such vastly differing fees for the same service. Luckily a new wind is going through museum land and more and more institutions are offering high-resolution pictures of objects in their collection free of charge; a fine examples being the Rijksmuseum in The Netherlands. Another noteworthy project is Artstor’s Images for Academic Publishing program, making publication-quality images from many bigger institutions (like the Metropolitan) available for use in scholarly publications free of charge. “Sharing is what museums need to learn to do”, as Deborah Ziska, a spokeswoman for the National Gallery of Art stated in a related New York Times article. I couldn’t agree more! This entry was posted in Opinions, Research and tagged Field-photo on May 30, 2013 by admin. 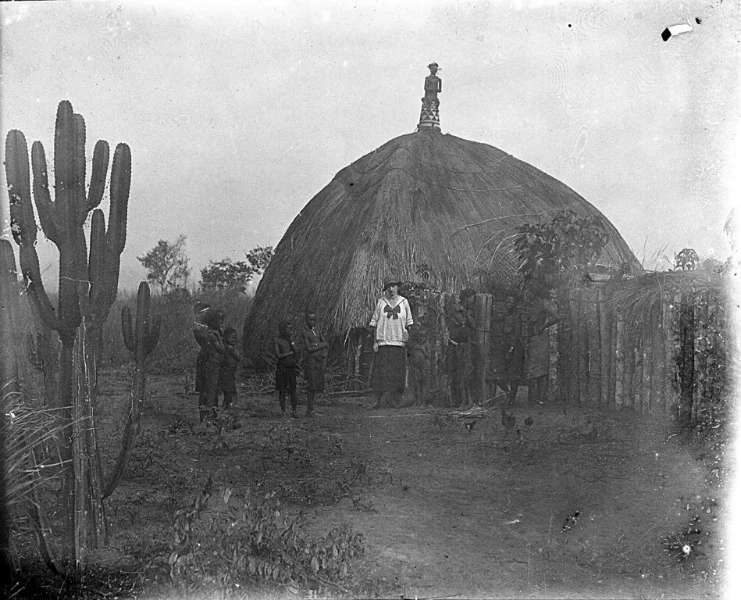 While doing research on the incredible Babanki elephant headdress in the last Sotheby’s sale, I encountered this wonderful field-photo (unfortunately withouth any contextual information). The contrast with the field-photo below, taken in Oku in 1976, was so striking I just had to share it. More wonderful Henning Christoph field-photos can be found here (scroll down). This entry was posted in Research and tagged Babanki, Field-photo on May 29, 2013 by admin. If you’re in the mood for field-photo’s, The Eliot Elisofon Photographic Archives are a fantastic resource. 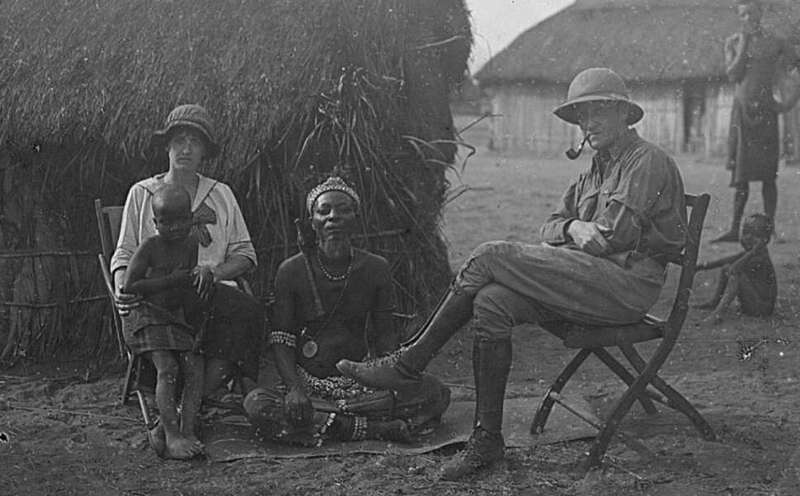 The Eliot Elisofon Photographic Archives at the National Museum of African Art is a research and reference center with over 300,000 still photographic images documenting the arts, peoples and history of Africa over the past 120 years. Eliot Elisofon (1911-1973) was an internationally known photographer and filmmaker. He created an enduring visual record of African life from 1947 to 1973. Mr. Elisofon bequeathed to the museum his African materials, which included more than 50,000 black-and-white photographs and 30,000 color transparencies. The Archives has since added to its holdings important and varied collections from widely recognized photographers. You can search by country, subject & cultural group. But, there’s more to the archive than only Elisofon’s pictures. As shown in the field-photo above, the database also contains photographs of lesser known individuals, Emile Gorlia being one of them. 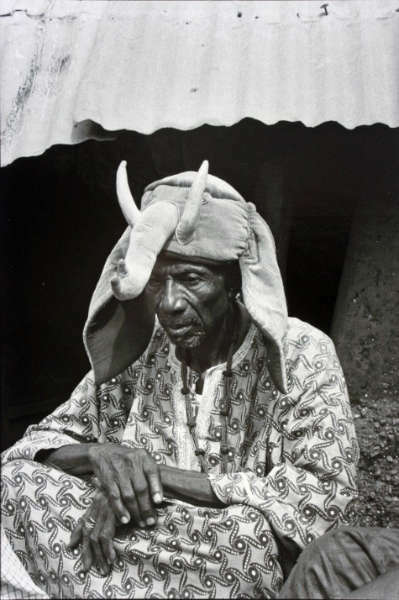 While Elisofon’s pictures are rather late (spanning a time-period from 1947 to 1973), the Gorlia pictures give a much earlier view of traditional African cultures in transition only decades after first contact. 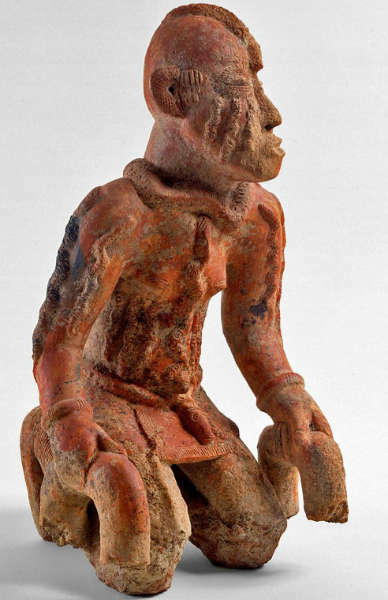 While only a small portion of the field-photos picture “art” (the Luba adze above or the Pende figure below), the majority of the pictures mainly illustrate the local daily life of the judge and his family and the peoples he visited. While on inspection tours through the region, Gorlia visited the Songye, Pende, Kuba, Luba, Kanyok, Tetela, Chokwe, and frequented noted places as Lusambo, Albertville, Bandundu, Boma, Matadi, the Sankuru River and The Stanley Pool. These pictures offer an unique historic view and bring life to all those legendary locations. You can find the complete list of the 1151 Gorlia field-photo’s in the Eliot Elisofon Photographic Archives here. Note that judge Gorlia’s wife apparently didn’t bring many outfits with her to Congo. On both pictures she’s wearing the same blouse! This entry was posted in Research and tagged Field-photo on May 27, 2013 by admin. If you still need an excuse for a trip to Paris next month, here it is. 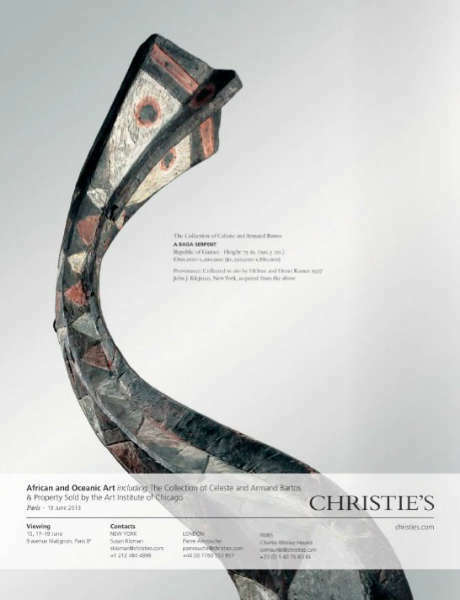 Both Sotheby’s and Christie’s prepared two sales. The online catalogue’s: Sotheby’s (18/06), Sotheby’s – Corlay Collection (18/06), Christie’s (19/06) & Christie’s – Jolika Collection (19/06). Get your auction paddles ready! 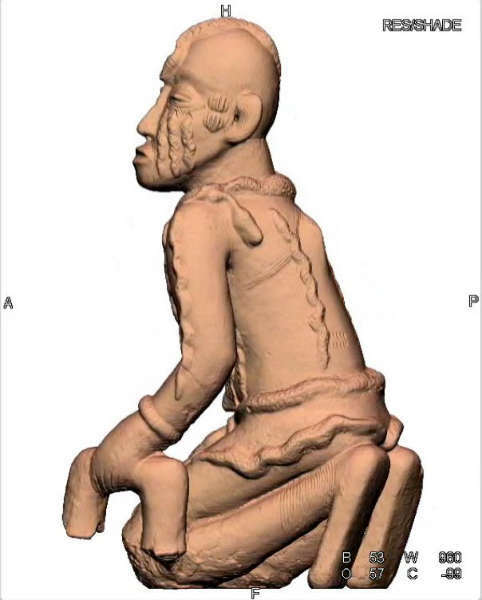 UPDATE: On the Détours Des Mondes blog there’s an interesting write up on the incredible Songye headrest that Sotheby’s will be offering, read all about it here (in French). This entry was posted in Auctions on May 26, 2013 by admin. I had the pleasure to receive a personal tour by Yaëlle Biro earlier this year and was quite impressed by this small but highly compelling exhibition. 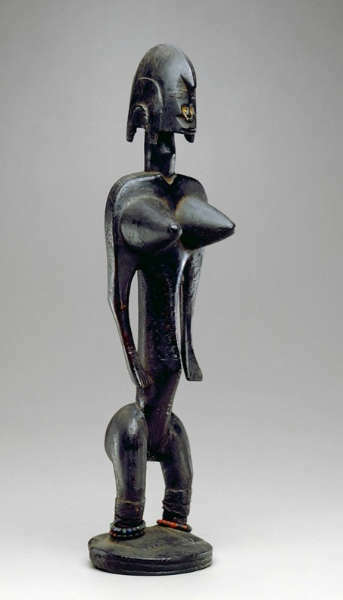 36 wood sculptures from West and Central Africa are presented alongside photographs, sculptures, and paintings by Alfred Stieglitz, Charles Sheeler, Pablo Picasso, Francis Picabia, Diego Rivera, Henri Matisse, and Constantin Brancusi highlighting the African works acquired by the New York avant-garde and its most influential patrons during the 1910s and 1920s. 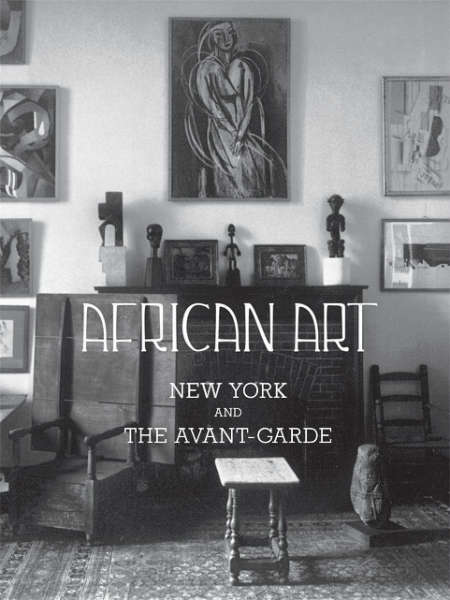 The exhibition brings together African works from the collections of many key individuals of the period such as Alfred Stieglitz, Marius de Zayas, John Quinn, Louise and Walter Arensberg, Alain LeRoy Locke, and Eugene and Agnes Meyer. 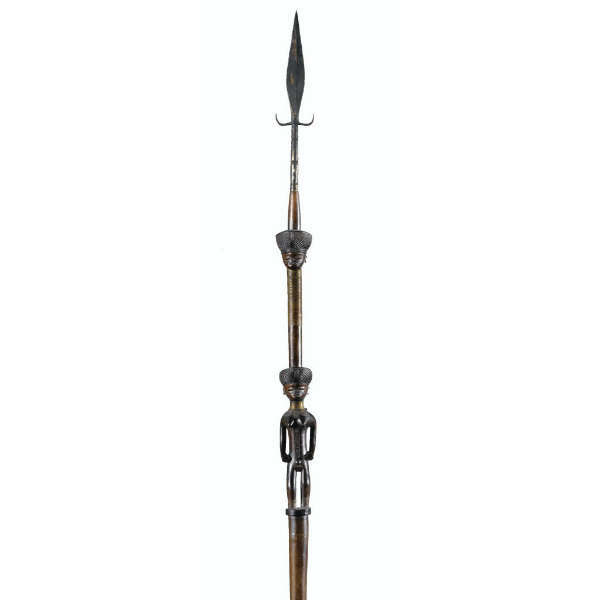 Together, these works of art from Africa and the Western avant-garde evoke the original context in which they were first experienced simultaneously almost a century ago. 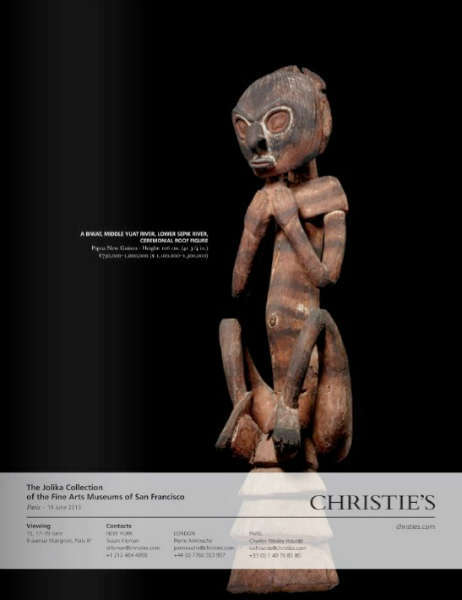 The exhibition is accompanied by a special issue of Tribal Art Magazine. The good news is that this wonderful show just got extended and will run until September 2, 2013. More information here and here. If you’re not convinced yet, you can read a praising New York Times review here. 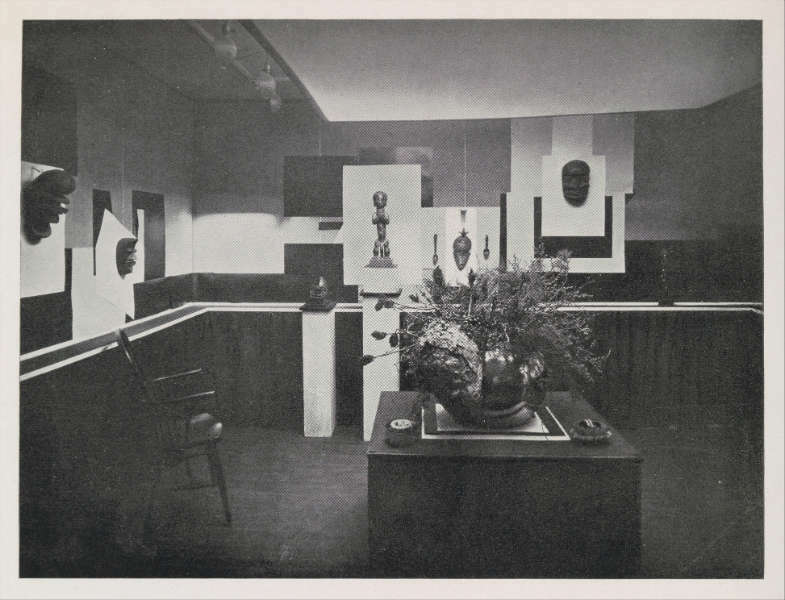 Thanks to Yaëlle Biro’s meticulous research many of the objects are presented again for the first time after disappearing into private and public collections after those early New York gallery shows. 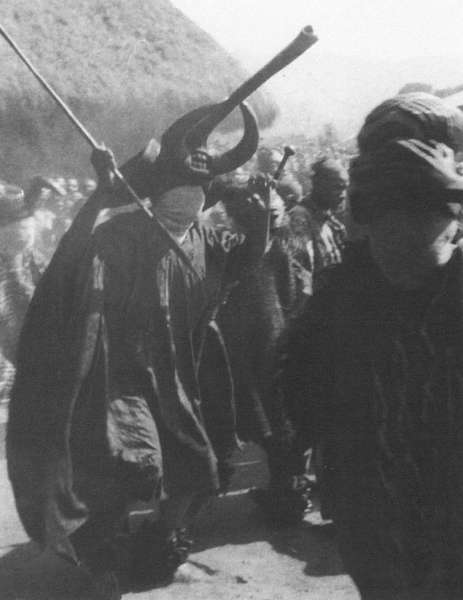 Many of them had not been seen in public in close to a century. From the Stieglitz photo from October 1916 below, Ms. Biro managed to find back the pictured Fang figure, We masks and Lumbo and Bete spoons, a very commendable outcome. 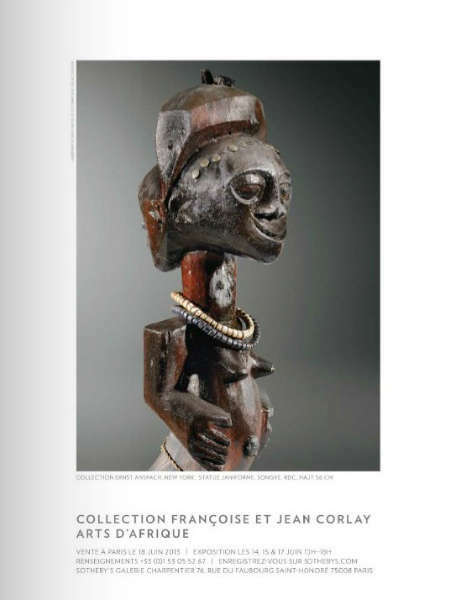 Together with the upcoming quai Branly exhibition about the trailblazing work of Charles Ratton, this exhibition represents a new momentum in the research of the first steps of African art in a western context. This entry was posted in Exhibtions on May 25, 2013 by admin. 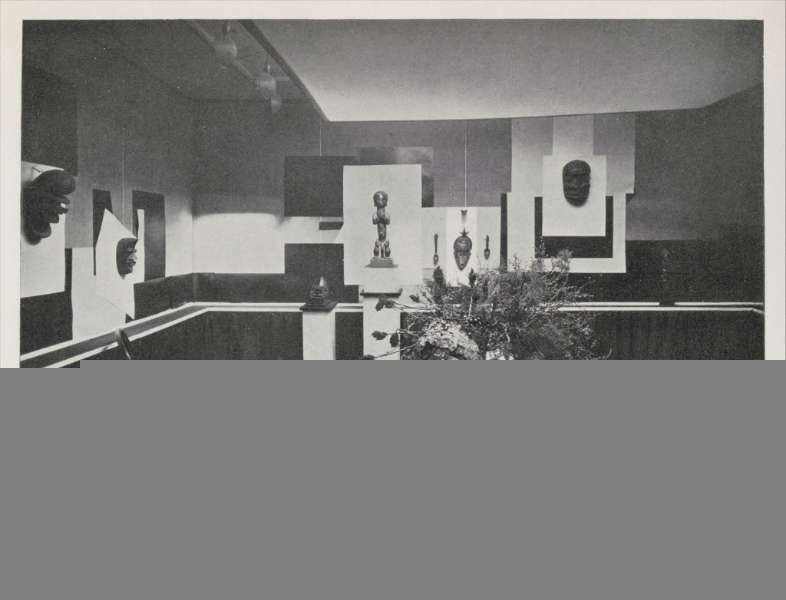 Online since May 2011, the Arti delle Mani Nere* forum is the online community where (mainly) Italian collectors gather to discuss African Art (*freely translatable to Art of the black hands). Its creator, Brescia-based Elio Revera, has succeeded in creating a lively forum where many critical but constructive discussions take place. Since the majority of the posts are in Italian, it’s also a good place to practice your languages. Only one part of the forum, “Love driven choices“, is in English, presenting objects from the forum’s members private collections. As is stated on the forum, “L’unico modo per moltiplicare l’amore, è dividerlo con gli altri” (the only way to multiply love is to share it with others), a goal I gladly endorse and support. This entry was posted in Research on May 24, 2013 by admin. 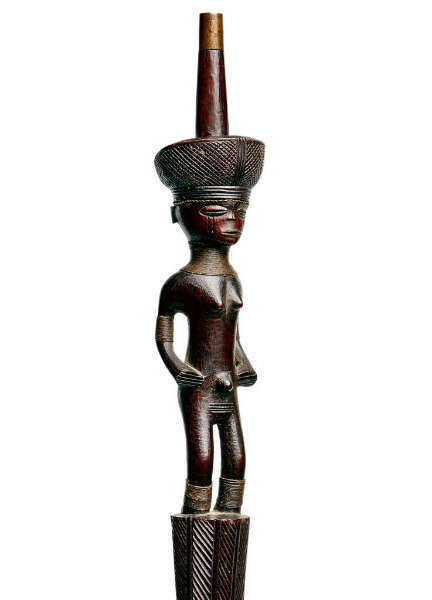 After numerous inquiries on the origin of anonymous labels and inscriptions featured on African art objects, I have decided to publicly make available a project of mine which wishes to document all these old registration numbers and labels. The present list is a work in progress. 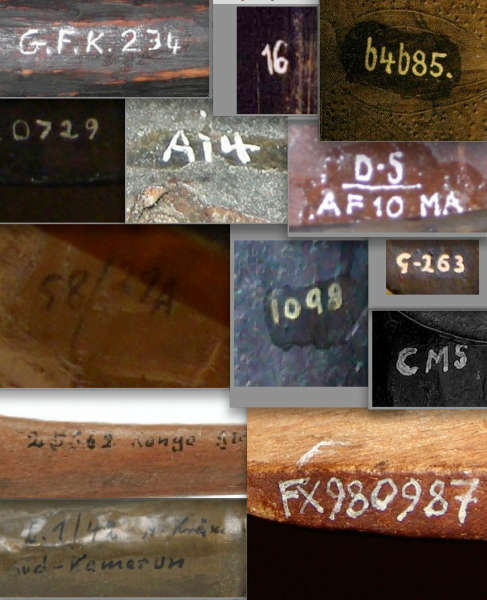 Please get in touch when you would like to share information and pictures of inscriptions or labels not yet listed. This entry was posted in Research on May 23, 2013 by admin.